Tulip is the leader in micro-liposuction and fat transfer instrumentation. They are innovators in liposuction cannula and injector design and manufacturing. Tulip create instruments and accessories for successful liposuction and fat transfer procedures. With their patent pending Cell Friendly Technology and new premium Gems Single-Use fat transfer instruments Tulip is your source for liposuction, fat-transfer and regenerative medicine cannulas, micro injectors and accessories. Belle is very proud to represent Tulip in the UK as Tulip is the leader in micro-liposuction and fat transfer instrumentation. They are innovators in liposuction cannula and injector design and manufacturing. Tulip create instruments and accessories for successful liposuction and fat transfer procedures. With their patent pending Cell Friendly Technology and new premium Gems Single-Use fat transfer instruments Tulip is your source for liposuction, fat-transfer and regenerative medicine cannulas, micro injectors and accessories. This single-use closed system helps size adipose tissue so that it is injectable with 27g and 30g needles. Tulip's NanoTransfer - taking fat transfer to the smallest level. The SoftBreast system uses the patient’s own fat tissue to correct asymmetries, improve cleavage and add a natural soft look to the augmented breast. Décolletage rejuvenation in the ageing patient completes the total Personalised Breast Enhancement procedure. 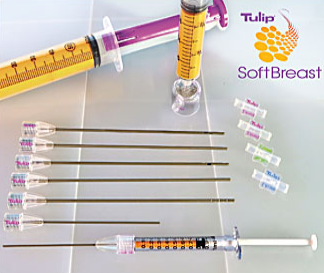 Tulip’s proprietary CellFriendly™ Technology is now available in premium, pre-sterilised, single-use instruments with our patented SuperLuerLok. Tulip GEMS are sterile, disposable liposuction instruments designed to eliminate the risk of cross contamination while providing top-of-the-line performance. Tulip GEMS glide easily through tissue and resist clogging. Tulip GEMS – simply the best. No other Fat Transfer and Fat Grafting instruments on the market have the Tulip Advantage. "Tulip GEMS are easier and quicker to harvest with. 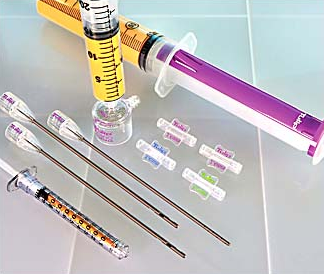 The disposable GEMS Johnnie Snaps are convenient and easy to place into the syringes." Tulip GEMS, a premium single-use, advanced harvesting and fat transfer system.